(ST. JOSEPH, Mo. )— The St. Joseph Mustangs' 2019 season will feature more fireworks, giveaways, and celebrations and it all kicks off against the Midwest A's on May 29. "St. Joseph is a special place for baseball," Mustangs general manager Ky Turner said. "Opening Night on May 29th is the official kick off into summer, and is a date all of our players have circled on their calendar. I know they're all excited to come play in front of one of the best atmospheres in summer college baseball across the country." The Mustangs will continue several traditions in 2019 including playing the Mustangs Alumni on June 14, as well as, honoring the armed forces with two home games on July 3 and July 4. Both games will feature post game fireworks. 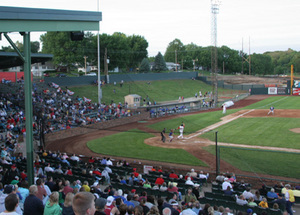 Along with hosting the MINK League All-Star game on June 26, the Mustangs will play a rare Sunday home game, on June 23rd. "We've had a lot of feedback about hosting a Sunday game at Phil Welch. We were able to make it work this season, and its an important game against a divisional opponent." Turner noted. The MINK League schedule at Phil Welch Stadium begins Friday, May 31 against Clarinda and then Saturday, June 1 against Chillicothe—two North division rivals. The 2019 season features one doubleheader at Phil Welch Stadium, against the Ozark Generals on June 6. In all, the Mustangs will play 27 games at Phil Welch Stadium in 2019. The Mustangs finished the 2018 season averaging 2,448 fans per game, ranking 8th nationally. Mustangs coach Johnny Coy will return for his second season, after notching a 24-24 record last season. Season tickets for 2019 are available by visiting Phil Welch Stadium or calling 816-279-STJO (7856).